Although David Willis and myself were colleagues at Askham Bryan College it is only recently have I learned of his quiet lifetime contribution to horticulture and an unexpected overlap with my own history. My friend Peter Williams recently wrote this lovely piece about David which was published in the newsletter of the Beverley group of the Hardy Plant Society. He has given me permission to republish it here. What links a Silver Swan, a church in County Durham and the most famous daffodil of the 1800’s? 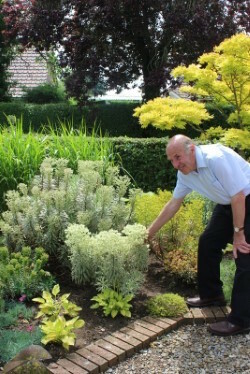 One day in the early summer of 2015, I was asked by my friend Roger Brook if I would join him and a group of his retired professional horticultural colleagues for lunch, and then allow the group to visit my garden. I immediately agreed, but as the day of the visit approached, I became increasingly nervous. Although I am normally quite confident showing visitors around my garden, I had never before entertained a group of professional horticulturists. However, within minutes of their arrival, my fears evaporated and I started to feel comfortable simply chatting about plants and enjoying the relaxed, good-natured company of fellow gardeners. When we looked around my polytunnel, one of the group identified Euphorbia characias ‘Silver Swan’ that I had propagated from cuttings and asked whether I considered it to be a worthwhile variety. I replied that I thought that it was a superb plant that looked good all year around. I explained that I was so impressed by its performance that I had propagated new plants to extend my initial planting. The questioner replied that he was very pleased that was the case because he had in fact, discovered the plant and was responsible for its introduction into commercial horticulture. Panic returned immediately because I knew that the variety was subject to Plant Breeders’ Rights and I thought that I might have broken the law. Was I in trouble? Well of course not. I was not trying to sell the plants, but was simply producing a few more for my own enjoyment. The discoverer of ‘Silver Swan’ was Dr. David Willis and I was so pleased to meet him that I asked if I could take his photograph with my original ‘Silver Swan’. David agreed with great good humour and posed with his discovery. "Little does he know I have lost mine"
June 'yes I am married to him"
A little while later, David contacted me to say that he wanted to return my favour and had a few ‘odd’ daffodil bulbs that I might be interested in growing. These turned out to be very special indeed. 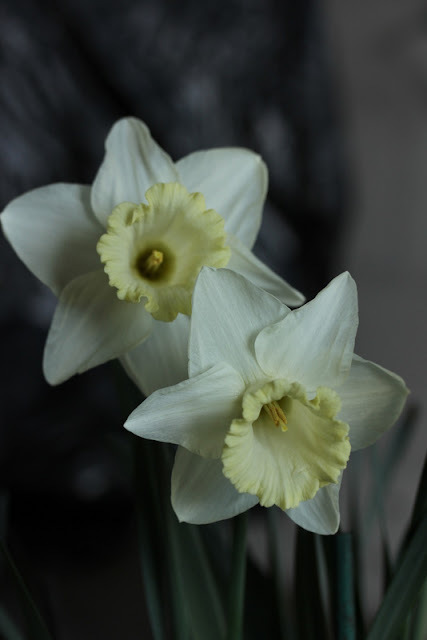 There were five bulbs of Narcissus ‘Empress’ and five of Narcissus ‘Weardale Perfection’. The hand-written label that accompanied the bulbs informed me that the former was raised by William Backhouse in 1865 and was the first triploid cultivar, and the latter, also created by William Backhouse, was the first tetraploid narcissus and had flowered for the first time in 1872. When the bulbs flowered in my glasshouse the following spring I was delighted by both daffodils but especially by ‘Weardale Perfection’. 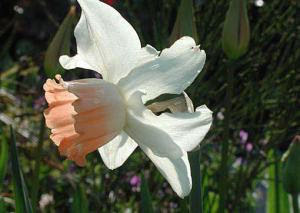 This truly lovely daffodil was tall, elegant, delicately bi-coloured and held its flowers strongly above the foliage. My delight turned to astonishment when I discovered the history of this cultivar and the story of its loss and rediscovery and the key role that David had played. William Backhouse was a Quaker and wealthy Darlington banker and the leading hybridizer of daffodils from 1855 until his death in 1869. His country home was at St John’s Hall, Wolsingham in Weardale, County Durham. 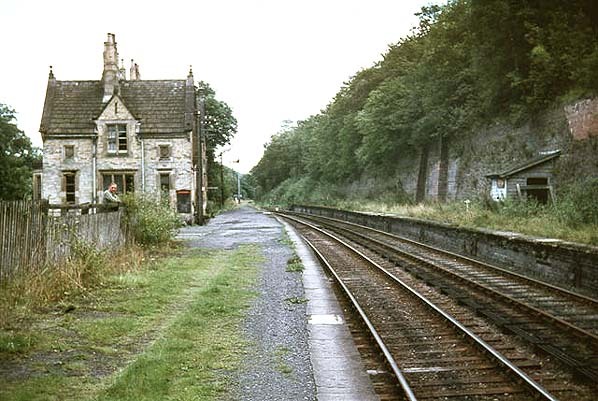 During the flowering season he undertook his plant breeding in the early morning before catching the train to Darlington to start his day’s work. Unfortunately, William died before the cultivar that was to become ‘Weardale Perfection’ first flowered in 1872. His sons witnessed the event and the variety became a sensation. In the 1900’s a single bulb cost ten guineas, equivalent to almost £2000 today. This makes even the current craze for snowdrops look quite sensible! Despite its cost, the variety became distributed widely amongst daffodil enthusiasts and an article in a Sheffield newspaper in 1899 indicated that when ‘Weardale Perfection’ was displayed in Totley Hall (a C17 mansion owned by fellow daffodil enthusiast W.A. Milner for whom William Backhouse named another of his crosses), some local workers were given time off to go and see the amazing new daffodil! The outstanding characteristics of ‘Weardale Perfection’ meant that it was quickly used in daffodil breeding programmes and many excellent new cultivars were developed. But as so often happens in horticulture, the swarm of hybrids replaced the parent and by the 1930’s ‘Weardale Perfection’ had disappeared from the bulb catalogues. When I first met David I realised that he was an expert horticulturalist but it was not until I received the bulbs that I discovered that his real passion was daffodils and that he was one of the UK’s leading authorities on these plants. David knew the story of ‘Weardale Perfection’s origin and subsequent demise because he had studied breeding records of early daffodil cultivars. Indeed, for a number of years he had been looking at catalogues from around the world and had tried without success, to obtain a specimen. The story advanced when a Wolsingham resident Margaret Keyte read about ‘Weardale Perfection’ and thought that an excellent Millenium project for the Weardale Society might be to find the daffodil and plant it in the churchyard where William Backhouse was buried. David was approached and asked for help with the project in 1998. The idea was to visit sites in the Weardale region associated with the Backhouse family to see if the daffodil was still growing. The aim would then be to isolate and bulk up stock that could be planted out for the Millennium event. Searches of likely sites did not reveal any plants that David could be certain were ‘Weardale Perfection’ but then there was a breakthrough. Margaret Keyte heard that the cultivar was still growing in a house in Wolsingham. The house had previously belonged to the district nurse Jessie Young, who had been known to grow the daffodil in her garden. The present owner was convinced that there was a single bulb of ‘Weardale Perfection’ growing in a mixed tub of bulbs but the flower had long-since faded, and identification was impossible. She kindly offered the tub to David and he moved it to his home in a village near York. After flowering in David’s care in 2000, the daffodil grew well and when the bulb was lifted in summer of 2000 it had produced a detachable daughter bulb. This daughter bulb was used for twin-scaling (a rapid propagation method that involves taking slices of the bulb with a section of the basal plate and at least two segments of bulb scales) and by November of 2000, David had ten new bulbils. 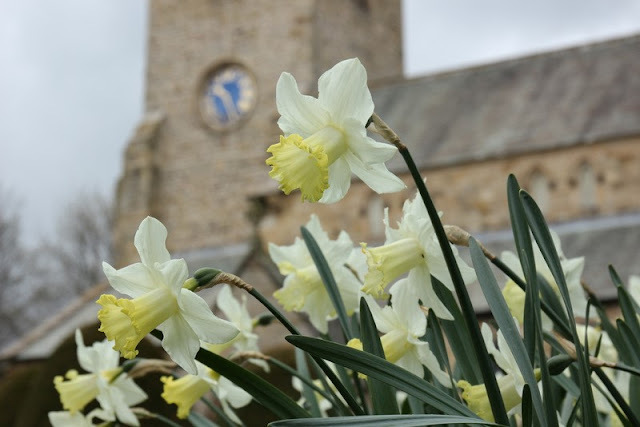 Over the next few years further twin-scaling was performed and in September 2007, five-hundred bulbs were planted out in the grounds of the Parish Church of St. Mary and St. Stephen in Wolsingham. The project had missed its Millennium target but the date coincided with the 200th anniversary of William Backhouse’s birth. I was so taken with the story of this remarkable bulb that I visited the church in April 2017 and the photograph at the top of this post shows that ‘Weardale Perfection’, is doing really well. This story also had another fascinating and totally unexpected outcome for David. He had been researching his family history and discovered that in the 1700’s, three generations of his family had been baptized, married and buried in the Parish Church of St. Mary and St. Stephen in Wolsingham. His great-great-grandfather’s grave is only fifty yards from the drift of ‘Weardale Perfection’ daffodils that David had propagated. I would like to acknowledge David’s help in providing information that allowed me to write this account and for reading the first draft. And if that wasn’t enough! 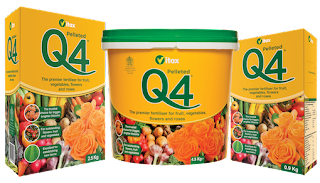 – many of us have for years used the general fertilizer Vitax Q4 that was formulated by David Willis in the 1960’s. 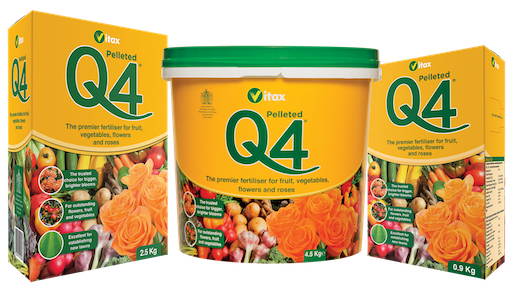 It was the first general fertilizer to contain trace elements and has been a best seller for 50 years. Peter omits to mention a detail of David’s invention of Q4. At that time National Growmore was the only semi decent fertiliser available to amateurs and David had the simple idea that if a general fertiliser was gently formulated in a granule with all the necessary plant nutrients, nitrogen, potassium, phosphate, magnesium, calcium and sulphur plus several trace elements it would have a ready market. He was correct and Vitax Q4 has been continuously marketed for fifty years. The nice thing about this story is that although David had had no contact with the manufacturer for decades they recently sought him out to celebrate the fiftieth anniversary of this fertiliser. David and June were ferried over to Cheshire and were guests of honour at a celebratory lunch. How many modern companies would show such appreciation? David has a curious overlap in my own gardening history. My old Hartlepool grammar school - which did not even teach biology - were horrified at my own career choice to go into gardening! Grammar school boys didn’t do gardening! It emerged and perhaps the story was meant to be salutary, that several years earlier a somewhat cheeky - and in his own words, bolshie - pupil had made the same career choice. Indeed he then worked on a nursery at the bottom of Westbrooke Avenue where I lived. I never met him at the time and it was nearly sixty years later that I learned we both started out from the same school. In searching for a picture of William Backhouse I stumbled on this very fine article about daffodil history. The blog carries many fascinating articles on themes of garden history. A truly fascinating story of the Daffodil Weardale Perfection’. The Euphorbia Silver Swans!!! well I simply want it. Unlike yourself I am an amateur gardener who nevertheless is totally absorbed with his hobby. I love the information you give. I wonder if you liked the blog Parks and Gardens I linked to? A wonderful story about several dedicated horticulturists.